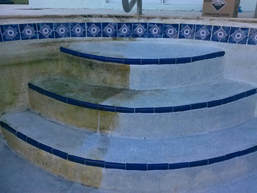 If you own a swimming pool in Temecula area and are looking for pool tile cleaning, look no further. We are the go-to provider of such pool service in Temecula. We understand that a quality pool needs regular cleanup, maintenance and servicing. This is why we are always on call to deliver a vast range of services to make sure your swimming pool looks as picture-perfect and new as you want it. To this end, we provide a comprehensive tile cleaning service as well. Over time, the tiles on the bottom and sides of your pool may incur different layers of dirt and grime. They may have calcium buildup on their surface, incur stains or lose their sheen and brilliant looks for any other reason. A few years ago, you would have to replace the tiles to restore that new look to your pool. Thankfully, this is no longer the case. Our licensed and professional Temecula experts provide tile cleaning services that can restore that impeccable look of your pool’s tiles without having to replace them. By using advanced cleaning methods and techniques, they will remove the stains as well as the calcium buildup and restore your tiles to their former glory. Whether your tiles have calcium buildup, oil residue, dirt, algae blossoms or grout that needs to be cleaned, we have got you covered. No matter how impossible the job seems, let us worry about it. Simply point us to your pool and our experts will bring back the brilliant and new look for your pool tiles. If the tiles in your swimming pool, spa, or fountain are broken, chipped or damaged in any other way, we can handle that as well. Our licensed experts of pool service in Temecula will inspect and evaluate the damage and then determine the quickest, most effective and most affordable method of repairing it. Being the trusted service contractor in Temecula area, we also pride ourselves in the way we handle tile cleaning jobs. We take every precaution to make sure that the job is performed and completed in a very safe and environment-friendly way. When you hire inexperienced companies to do the job, the greatest risk is to your pool and the surrounding property. By using unsafe methods and stop-gap solutions, they may end up damaging your pool further and also adversely affecting your property.